So I’m looking for a car with enough room for 3 car seats to replace my faithful e46. I’d been thinking long & hard on the CTS-V wagon for the last several weeks until I test drove a sedan last week. I sat in the rear seat & at the time figured that there is no way that 3 car seats would fit in the rear. However, I’ve been doing some research on a car seat forum (imagine that!) & have found that there are several combinations that should work in a mid-size vehicle. 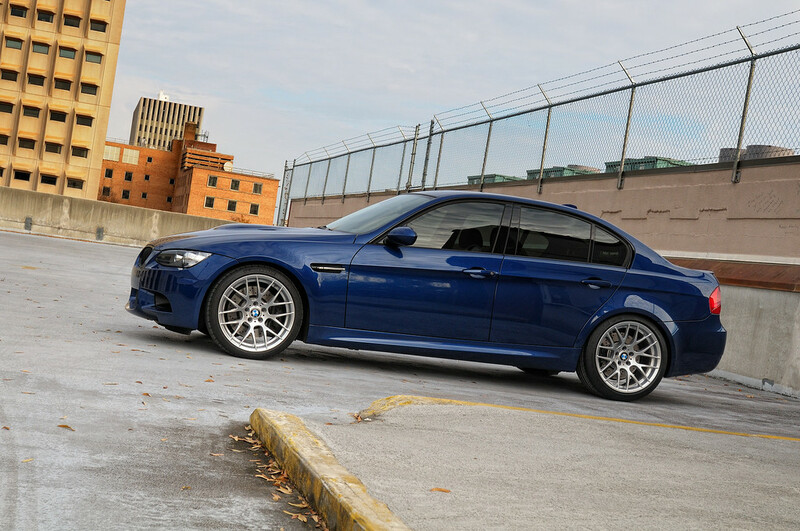 Therefore, I’m again considering a V wagon, I also test drove an e90 M3 w/ ZCP today. The CTS-V & M3 are tied at this point, I’d love to be able to track either of these cars on weekends (I’d wanted to do the same with my e46 but unfortunately never was able to, for one reason or another). Also, my wife has an Acura MDX which we can use for family duties/weekends. I’d also test fit 3 carseats in each car prior to ordering. Pros: 556hp! Wagon may be a bit more practical than an e90 sedan. Not many around. Magnetorheological shocks produce a very comfortable ride in touring mode. Available in a 6-speed manual. Gorgeous exterior, I like the interior. Excellent warranty coverage (including 5yr/100K powertrain)/free maintenance. Very well specced as standard, I’d likely add the optional Recaros. I won’t be tempted to mod the wagon. Tri-coat thunder gray is beautiful in person. Cons: Heavy! Low red-line! Only interior color options are gray vs. black. Holy wheel gap! Pros: Lightweight (compared to the V wagon). I liked the DKG. ZCP produces a nice stance as standard, I obviously love the ZCP wheels. Cons: Honestly, the looks, I still haven’t quite gotten used to the appearance of this generation. It will be hard for to keep from spending $$$ on mods. Options add up in price quickly. Pros: Obviously would be more practical, decent handling vehicle for its size/weight. Cons: Options add up in price quickly. Shy of an Avant, the CTS-V wagon is teh hottest wagon ever. I would strongly recommend the wagon. Also, if my brother can fit 3 car seats in his Cherokee, you can fit 3 in the Caddie. Lastly, a track wagon would be the ish. How old are the kids? I personally wouldn't want crayons, cheerios, piss, boogers and all the other disgusting things that accompany a very young child in any of those cars. That said, CTS-V wagon. Mixes the added practicality of the X5 and the fun of the M3. Not to mention you'll have quite a unique ride. No brainer, really. CTS-V wagon, you're gonna be the coolest dad in the neighborhood lol. CTS-V wagon, without a doubt. Most reliable car, the best looking, and a pleothera of aftermarket support. Lastly, a track wagon would be the ish. my e46 was my daily driver & only car for several years & i was able to keep the car clean despite all the "crayons, cheerios, piss, boogers and all the other disgusting things"; admittedly, it'll be harder w/ another addition! cool, i thought this thread would bring out the bimmer fanboys! Yes, american cars (gm specifically) always have a ton of high quality parts available, and they are usually a lot cheaper than parts for German cars. Big congrats on the new addition! Corsa will solve all your problems! It is bar-none the best exhaust system you can buy for any American V8 car. I personally ran it on my GTO and it was awesome. How does the ctsv handle? And Im not so sure about tracking a wagon. For street use, get the ctsv and keep the e46 for the track. All times are GMT. The time now is 02:41:21 AM. Discussing Would like your thoughts on a CTS-V wagon vs. E90 ZCP M3 vs. BMW X5 50i in the Off Topic Forum - Place to discuss this and that. Note: We also have "request to join" forums: Guns and Fitness.